This is a simple dish where the success relies on the quality of the ingredients. 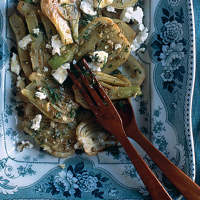 The fennel is half-grilled but still raw enough to be crunchy. Start by preparing the fennel bulbs. First cut off the leafy fronds. Then slice off some of the root part and remove any tough or brown outer layers. Cut off 2mm of the curved ends of each fennel and then slice it lengthways into slices 1–1½cm thick. Melt half the butter and half the oil in a large frying pan on a high heat. When the mixture starts to foam, add one layer of sliced fennel. Do not overcrowd the pan. Cook the fennel for about 2 minutes without turning it over or stirring it around in the pan, until one side has turned light golden. Turn the slices over, using tongs, and cook for a further 1–2 minutes. Remove from the pan and set aside. Continue with the rest of the fennel, using up the remaining butter and oil. Once all the fennel has been seared, add the sugar, fennel seeds and plenty of salt and pepper to the pan. Fry for 30 seconds, then stir the fennel slices back into the pan, caramelising them gently for 1–2 minutes (they need to remain hard inside so just allow them to be coated in the melting sugar and seeds). Remove the fennel and leave to cool on a plate. To serve, toss the fennel in a bowl along with the garlic and dill. Taste and adjust the seasoning. Arrange on a serving plate, crumbling the goat’s cheese on top. Serve at room temperature.